It’s been a while since I last added anything here, partly because I’ve been meeting artists whose work is supported through the Swiss Agency for Development and Cooperation in Central Asia. As ever, I came back inspired by what people do in very challenging circumstances, and how much it matters to those involved; I will write about some of those experiences in the coming months. For now, here’s a brief account of the work being done to revive the town theatre in Kanibadam (Tajikistan). The performance I saw there was moving and exhilarating in equal measure, and I drew on it when I gave a talk at a community theatre festival at the National Theatre Mannheim yesterday. Here are the first paragraphs of that talk, which you can download in full by clicking here. Kanibadam is a town of about 50,000 people in the east of Tajikistan, close to the borders of Uzbekistan and Kyrgyzstan. Like many parts of the former Soviet Union, it has experienced great economic, social and political pressures since 1991. Today, as many as one in four Tajik citizens have seek work abroad, especially in Russia. Two weeks ago, I was lucky to see the première of a new production in the town’s State Musical Theatre named after T. Fozilova. The building is almost 100 years old and in desperate need of renovation: there are earth toilets at the back of the yard. A first, crucial step has been made, with support from the Swiss Cooperation Office in Tajikistan, with the installation of modern light and sound equipment. The play I saw was the first presented with up to date technical facilities and the auditorium was packed for the afternoon performance. There were mothers with children, pensioners, teenagers at the back: only the working age men were few. The play, ‘Mother, Tomorrow I’m Getting Married’, was adapted from a Russian text and told interlocking stories of families whose young people wanted to marry. Such romantic situations are the stock in trade of theatre, but this play focused also on the risks of early marriage, domestic violence and debt, as families overspend to show Tajik values of hospitality. This is such a problem that it is illegal to invite more than 150 guests to a wedding in Tajikistan. The audience loved the play. It’s a cliché but the atmosphere really did feel electric as the drama unfolded its alternating layers of comedy and tragedy, and the applause was long and enthusiastic. Everyone stayed to hear the President of the City Council praise the theatre for the excellence of the performance and particularly for having raised urgent problems faced by Tajik society. Then the director, Muhiddin Juraev, spoke passionately about his desire to revive Kanibadam’s theatre and place it at the heart of the city’s life. Fervent applause frequently interrupted both speeches. Afterwards, I spent some time talking to Muhiddin Juraev and Dilbar Sulaymonova, the manager, about their hopes for the theatre. Juraev was born in the city and it was here that he discovered what drama could be. 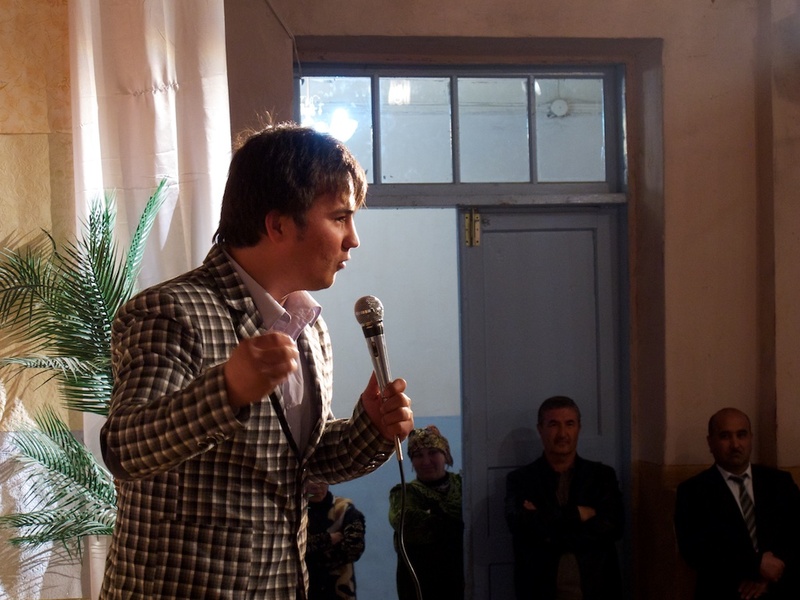 After his studies and an intensive, life-changing stage director’s lab at Ilkhom Theatre in Tashkent, he accepted an offer to come home and revive the theatre in his home town. It was an exceptional chance for a director still in his twenties and he knows its value; he knows too what he must do to succeed. His task, he told me, is to win back the trust of local people. What I saw on stage and the plans he outlined give confidence that Muhiddin, Dilbar and their colleagues will indeed renew the contract between this theatre and its community and so play a vital role in how the city meets its challenges.